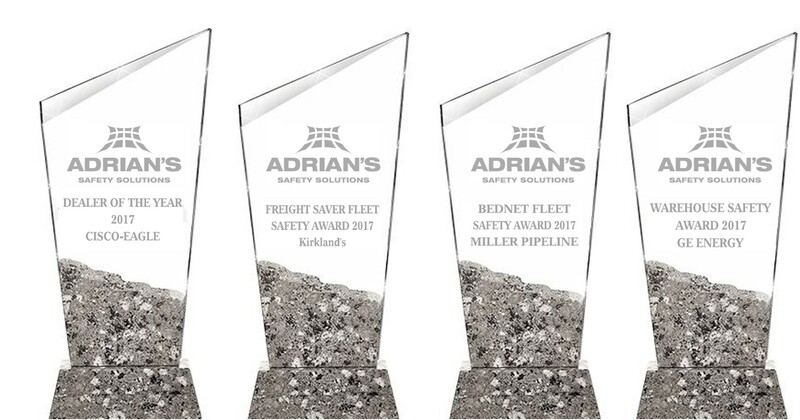 Adrian’s Safety Solutions is presenting four awards to outstanding companies with excellence in safety practice and culture. Dew explains that one of the missions of Adrian’s Safety Solutions is to make the workplace safer by offering affordable safety solutions. “Each award recipient has exemplified superior commitment to workplace safety and great safety technique choices in the workplace,” said Dew. According to Dew, effective control of pallets and cargo, whether on the road with fleet customers such as Miller Pipeline or Kirkland’s or relative to warehouse safety with GE Energy Connections, is the core of Adrian’s Safety Solutions business. Terry Wagner of Forklift Systems, an authorized warehouse dealer of Adrian’s, says they worked with GE Energy Connections to increase the safety level at its facility. “GE has long been known for leading the charge to provide safe workplaces and we join Adrian’s in congratulating them on enhancing their facility safety, which has now been recognized through the Warehouse Safety Award,” said Wagner. Adrian’s Safety Solutions congratulates all these recipients for leading by example. “These award recipients continue to cultivate an ideal environment for workplace safety and understand its importance as a top priority,” said Dew.